When it comes to game day, you’ve got your chips, your jalapeno poppers, your nachos, your chex mix. All great, all predictable. For the big game, you really want to pull out the stops. You want bigger, cheesier, more decadent, more iconic. 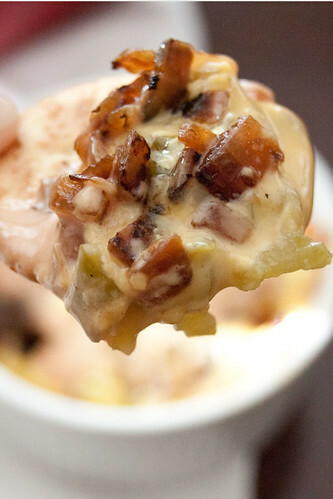 You in short want this cheeseburger dip, inspired by my favorite fast food burger – the In-n-out double double animal style. It’s got cheese, it’s got grilled onions, it’s got pickles, it’s got spread – it’s basically eating an In-n-Out burger in a bowl. I may seem like a hoity toity food person (has anyone seen my baker’s twine?) but deep in my heart I really love a good cheeseburger. And the cheeseburger I really love best is a Double-Double, animal style, from In-N-Out. If you’re not from around here, or you’ve been hiding under a rock, In-n-Out makes the best fast food burgers in the world. And I, like many Southern Californians (and frankly non-Southern Californians) am borderline obsessed with them. Los Angeles is a burger town, in the way that New York is a pizza (or hot dog) town, and Chicago is a hot dog (or pizza) town (and San Francisco is a ? town? Odd ice cream flavors? Fresh figs? Mesclun?) Angelenos take their burgers seriously. As I craved cheeseburgers during my entire pregnancy with Boo (who is turning out to be a meat and potatoes man, no surprise), I’ve sampled many of the fine burgers that LA has to offer — Umami Burger, Father’s Office, Pie and Burger, Big Jo’s … but in the end, I’m a burger purist, because none really measure up to In-N-Out. It’s the ur-burger. It’s not that the ingredients are stellar (good quality, I would say, for fast food, but not stellar) or that the burger is everything you can imagine a burger to be – but I don’t think you can do much better, food-wise – for your $3 than to spend it on an In-N-Out Double-Double Animal Style. Animal Style, off the In-N-Out Not-So-Secret Menu, means the burger patty has been grilled with mustard, the raw onions (never my favorite) have been replaced with the addictive little flavor bombs of fried onions, pickles have been added (!) and there’s extra “spread” – really Thousand Island Dressing (!!). The combination of all the elements is a salty flavor explosion that makes you want to go back again, and again, and again. Braver cooks than I have recreated a Double-Double Animal Style Burger from scratch; (And you should really read that link – it’s one of my favorite pieces of food journalism ever. I told you I’m obsessed. J. Kenji Lopez-Alt has earned my undying respect for his mathematical analysis of In-N-Out Burger Spread.) Fortunately, I’m lucky enough to live close enough to several branches of In-N-Out that I don’t have to go that far. But as I was musing on Super Bowl recipes (gross out food) and In-N-Out Animal Style Fries (also gross out food) I hit on the idea of a dip that recreates the experience of a Double-Double, Animal Style. Only with crackers. What’s not to love about that? This is not healthy food. There is no kale involved. But sometimes you just need to embrace your inner Animal Style and go with what you really love. Pour the oil into a large skillet over medium high heat. Add the chopped onions and sprinkle with salt. Cook, stirring frequently, until the onions start to brown. Add a few tablespoons of water and let it cook off. Repeat, stirring the onions frequently, until the onions are a deep golden brown. Taste for seasoning and set aside. In a large skillet, brown the ground beef. Pour off any extra fat, and stir in the mustard and salt and pepper to taste. Mix the ingredients for the spread together and stir well. In an oven proof dish, place the meat. Chop the dill pickles and add them on top of the meat. Cover the pickles with the cheese slices or velveeta. Bake in the oven until the cheese is melted - about 10 minutes. Top the cheese with the fried onions and the spread. Serve immediately with potato chips or ritz crackers. 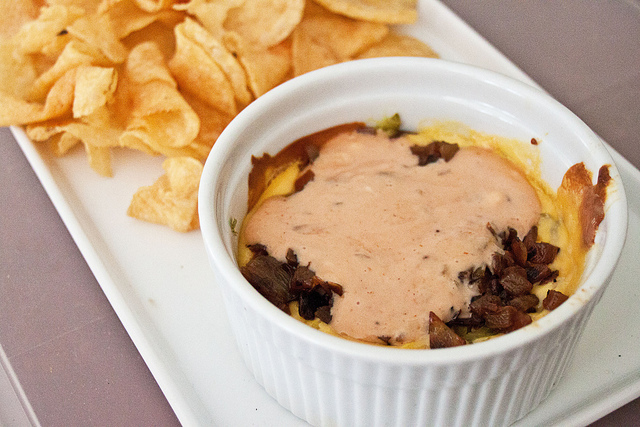 You can also omit the meat if you want a vegetarian "animal style" dip. Well, I did say more vegetables, not only vegetables! I’ve got some great veg recipes coming up. I so have to make this. My husband is In-N-Out obsessed. Not so great when we live in Canada! Man, I love In N Out.